By thal in Maps on 5 février 2019 . Recently there’s been a surge of attention to an old project of mine that brought me a weird mix of very positive and super negative responses when I started on it. A few years back, Wayne of Wayne’s Books sent me a free set of classic AD&D books with decent guts but wrecked covers for me to work on for a project I had in mind – to add house rules, annotations, marginalia, and extra drawings to these old rule books. But with things as busy as they are these days, the project fell by the wayside. 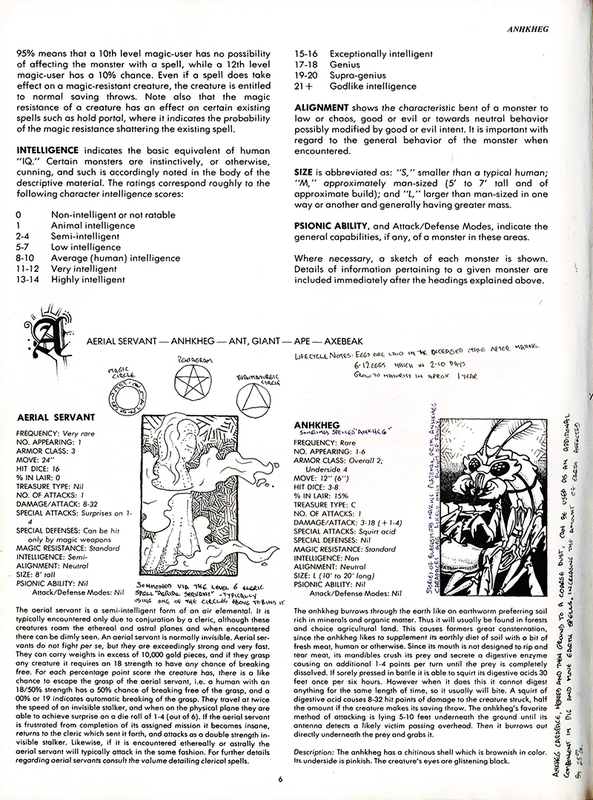 If I ever complete even the first book (the Monster Manual), the plan is to then cut it apart, scan it, then rebind it with a custom cover before auctioning it off. But until I am done that project, I figured I could scan the existing pages from the book and post up moderately low resolution scans of the work to date. Because the book hasn’t been cut apart yet, marginalia close the binding will be difficult to read.